Globalization, plus the increase in consumer interest in food and a nagging sweet tooth, have pushed the desire for bolder and more diverse flavors beyond center-of-plate. While classic desserts continue to please, sweet treats incorporating flavors and ingredients of cultures from around the world inspire menus and guests across the U.S. A recent Datassential Food Bytes report indicates that as consumers’ food knowledge expands, so do their palates, inspiring them to seek out new concepts and fresh flavors so they can personally experience what they have read or seen. The same report reveals that specialty ethnic restaurants, as well as inventive fast-casual and chef-casual eateries, have encouraged the trend. “Chef-casual joints, which are casual restaurants owned by fine dining chefs, offer consumers the uniqueness and artisan qualities of fine dining without high cost or intimidation,” states the report. 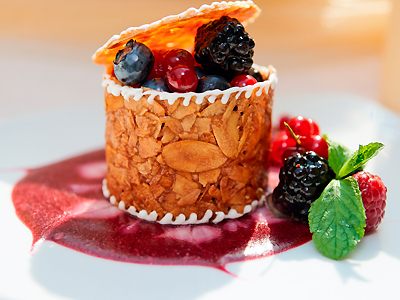 But you don’t need to be a fine dining chef to incorporate global flavors into your confections. Sweetening a current offering with exotic herbs, spices or chocolate or offering your own ethnic spin on a classic dessert provides a delightful finish to any globally influenced menu.